Vulcan SFM, a subsidiary of Sheffield Forgemasters International Ltd, is a design and manufacturing specialist with particular expertise in high integrity steel castings and forgings for offshore oil and gas production environments. The company has established itself as the world leader in the design and supply of heavy castings and forgings to the global offshore industry and has a long history of supply to BP projects including all of the major platform developments in the North Sea. The latest Clair Ridge project is the second phase of the development of the Clair Field, which lies 75km west of Shetland in water depths up to 150m and has been estimated to yield 250 million barrels of recoverable reserves. The development proposal for Clair Ridge consist of two bridge-linked platforms to be located North-East of the core area of the field. The platforms’ drilling radius can cover up to 5km and their function will not only be to produce the reserves from the ridge area of the field, but to also act as a hub for future subsea developments. Clair Ridge has been engineered to produce 640 MBOE and peak production should near 120,000 barrels per day. Vulcan SFM has supplied all of the structural and heavy lift castings for the Clair Ridge jacket and topside modules. This latest opportunity for components for the Clair Ridge project involves the supply of two 22 inch wye pieces, which are required for the convergence of two incoming pipe lines into one outgoing pipe line. Vulcan SFM has supplied wye pieces for many projects as both castings and forgings. In this case the wye pieces were specified as forgings with specific requirements for strength, toughness and weldability. Vulcan SFM carried out the engineering design verification, optimising the shape and using a new proprietary material grade capable of providing the required strength and toughness and giving good weldability. This was especially important given the requirement to weld pup pieces to each opening and because the internal surfaces were to be weld overlay clad with Inconel 625. This special requirement for the cladding led to Vulcan SFM contacting Arc Energy Resources, a leading UK welding specialist with 20 years’ experience in weld overlay cladding and fabrication in the oil and gas industry. Arc Energy Resources’ manufacturing infrastructure is qualified to BS EN ISO 9001:2008 and BS EN ISO 3834-2, whilst it also holds ASME U & National Board R stamp certificates of authorisation and is qualified to clad a wide range of base metal/cladding combinations to ASME IX, API 6A and NACE amongst others. The company also provides in-house test weld, heat treatment, PMI, FARO Arm inspection and NDT facilities. 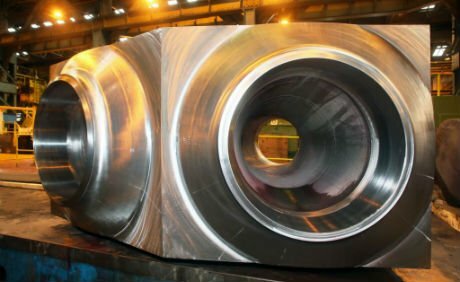 For the wye piece internal contour, the pre-clad sizing and clad thickness were all carefully considered in the design to allow for the final Inconel layer thickness and adequate sweep on the transition radius to fulfil the pigging requirements. The development of the design to optimise the pigging requirements introduced new challenges for Arc Energy Resources’ cladding equipment and required the company to build an extended pit to accommodate the wye piece at its final size. Ian Nicholls commented that for Vulcan SFM, cladding a wye piece was a new procedure. However, Arc Energy had the knowledge, experience and equipment to complete the work so he was very pleased to build on the established relationship and work with them on this project. Ian reports that Arc Energy performed very well on that project, running the procedure qualifications extremely thoroughly and completing the work on time and to a very high standard. He adds that for the Clair Ridge contract, Vulcan SFM had to pre-machine the wye pieces to accept the cladding and then the final clad diameter had to be very carefully controlled to allow the pig to pass. The gauging pig used for inspection of the finished bore sizes had a diameter that was 99% of the finished drawing dimension. The successful test proved that very tight dimensional control was achieved by the pre-clad machining and the CRA overlay deposition processes. “That’s where Arc Energy Resources’ expertise was vital – being able to clad such a large piece using one of its special Rotating Head machines.” He says. This is where Arc Energy’s £500,000 investment in two rotating head welding machines proved invaluable. Money well spent says Alan Robinson, as the two rotating head welding machines increase productivity, extend the size and scope of work the company can process, and expand its capacity to handle orders for cladding large and/or complex components. While normal welding workstations move components around a fixed welding torch, the rotating head machines use automated controls to manipulate the welding torch around a fixed component, accurately positioning it to apply the overlay while working close to the component’s footprint. The machines certainly proved capable of handling the wye pieces, which would normally be considered extremely difficult to weld clad.